When an extraction is necessary to remove badly damaged teeth or to prepare your mouth for orthodontic treatment or dentures, Dr. Lenz is able to safely and efficiently perform the procedure onsite. Many practices are not equipped to handle extractions and must refer them out to other facilities making it inconvenient for the patient. 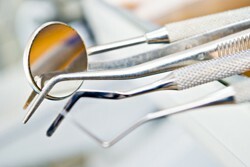 At Reynoldsburg Dental Center, Dr. Lenz will use anesthetics to ensure your comfort, and then carefully and precisely perform the procedure so that it heals quickly resulting in a healthier mouth and smile.